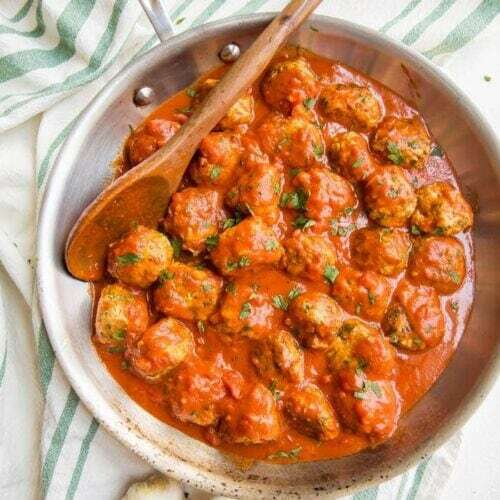 These are the best ever paleo Italian meatballs with creamy tomato sauce! 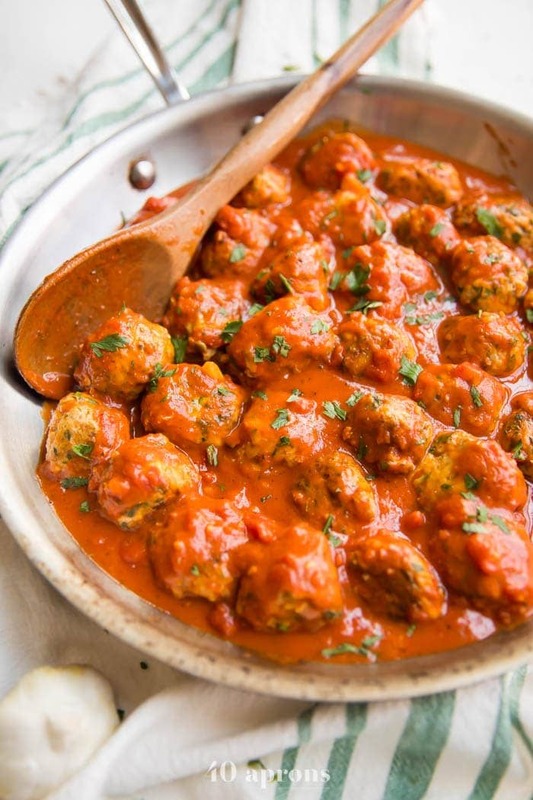 With lots of veggies in the meatballs, they’re so tender and loaded with flavor, and the creamy tomato sauce is perfection. Whole30 and keto friendly, too. Is your Whole30 MO like ours? 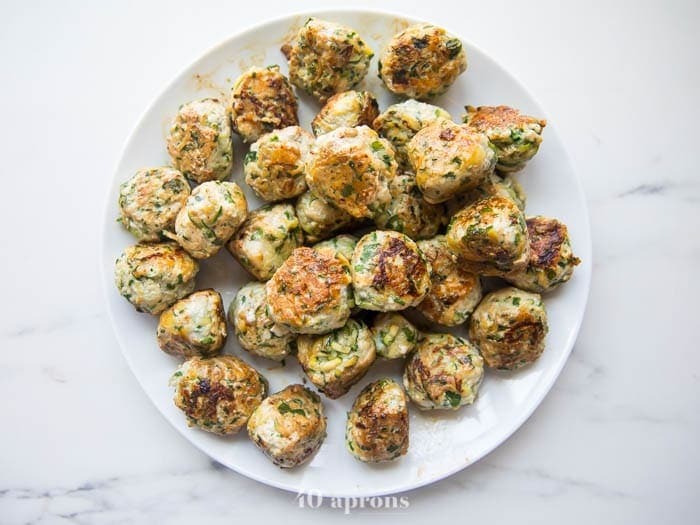 The month of squeaky clean eating and elimination of allergenic foods could otherwise be called “The Month of Meatballs.” They’re just so easy to throw together for a dinner or to meal prep for the week, aren’t they? To dip in Whole30 dump ranch or stir into a creamy sauce. Oh, oh oh. 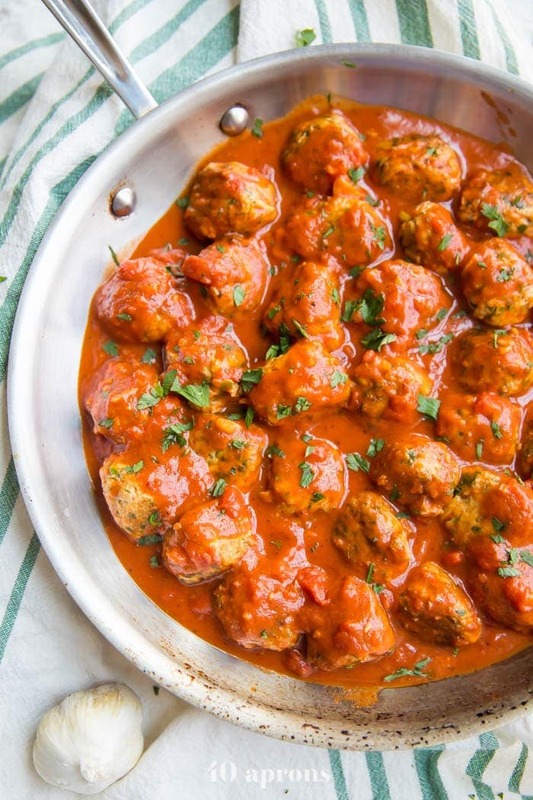 These are the best ever Italian paleo meatballs. 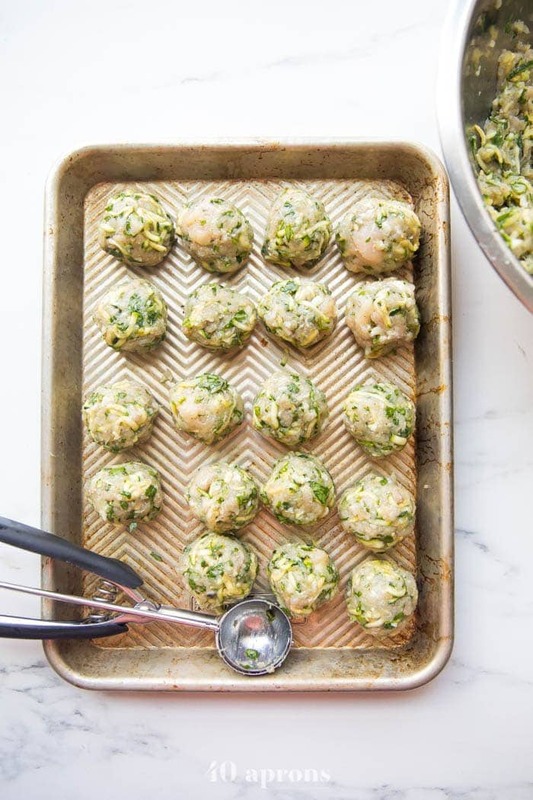 They’re made with shredded zucchini, which keeps the meatballs super tender as well as ups your daily veggie intake (And the kids will never even know it’s there!). The creamy tomato sauce is super simple but also kind of life-changing. The coconut cream cuts the tomato’s acidity just enough to make you want to treat the sauce left in the bowl as a soup… Slurp up, my friends. 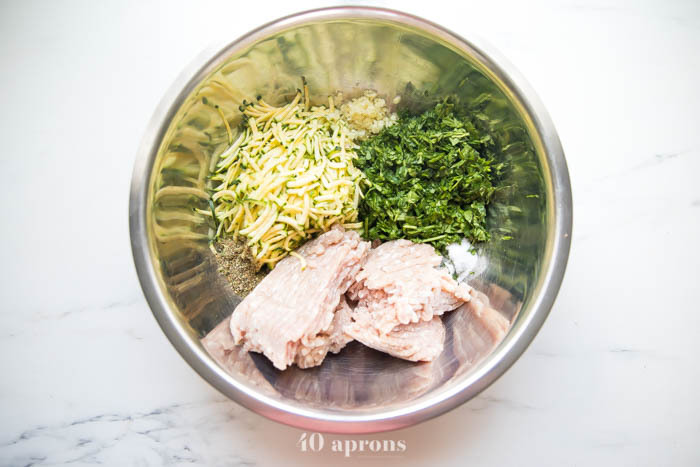 These Italian paleo meatballs are actually quite easy to make, especially if you use a disher to portion out the individual meatballs, so they’re fantastic for meal prep. They keep so well, too! I made a big batch then ate them every single day after for lunch, always gushing over a full mouth of food, These are the best ever Italian paleo meatballs, how is this possible, how are they still so good, what is this sauce, and what is this black magic, do I owe a witch my firstborn or something? And my assistant just sat there with her mouth full of Italian paleo meatballs going I don’t know if you owe a witch your firstborn but your firstborn is worth it for these meatballs dammit. Use ground chicken or beef in place of the ground pork in this recipe. 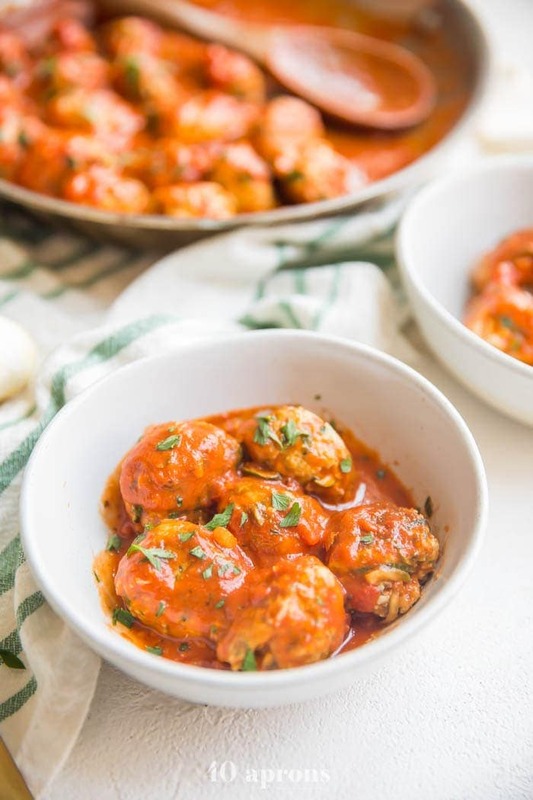 I prefer chicken and pork for these Italian Whole30 meatballs, since it stays more tender in my opinion, but a ground beef that’s not too terribly lean would be good, too! Swap out the chopped spinach for chopped chard leaves or even kale! 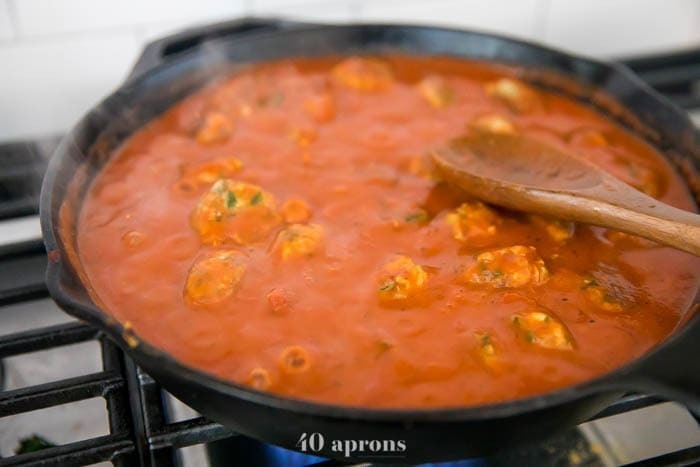 Increase the coconut cream for an even creamier tomato sauce. This recipe makes a good amount of sauce, because sauce = life. However, you can cut things down to 1 can crushed tomatoes and 1/2 cup coconut cream, if you prefer. Simply neatly half the sauce ingredients, and there you go! Use a food processor with a shredding blade attached to make prepping the zucchini super easy. Chop the spinach pretty fine so it blends beautifully with the meat mixture. Use a disher to evenly and quickly portion out the meatballs. I like this one. Mix together all meatball ingredients. Use a disher to portion out the meatballs and roll slightly to form even spheres. If you don’t have a disher, use a spoon to try and portion out the meatballs mixture evenly then roll between your palms. 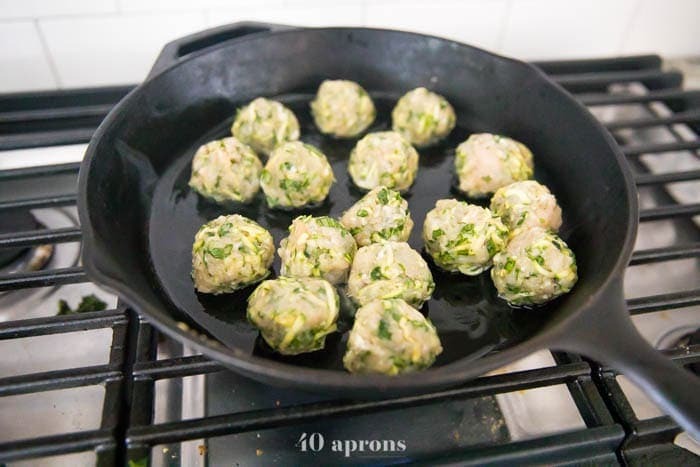 Fry meatballs in coconut or avocado oil in a large skillet, working in batches. Transfer to a plate. 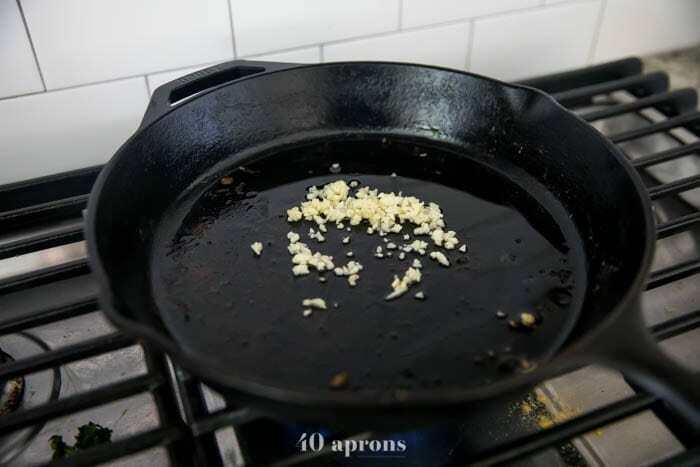 Sauté garlic in the same pan, adding a bit of oil, then add remaining sauce ingredients. Bring to a low boil and reduce heat slightly; simmer until a bit thickened. Return meatballs to skillet and simmer a couple minutes in sauce. Serve over zoodles or alone! 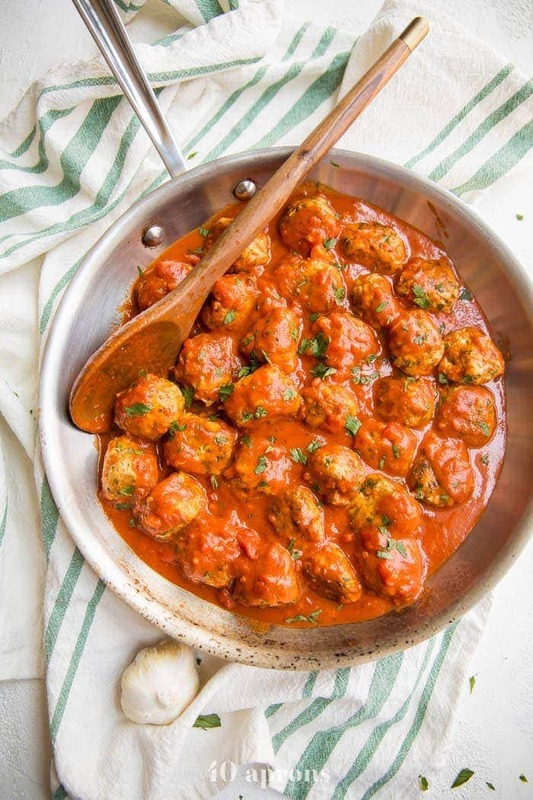 Tender Italian paleo meatballs loaded with veggies and flavor, served with a rich, creamy, garlicky tomato sauce. Whole30 and keto. Combine all meatball ingredients in a large mixing bowl and mix until combined well, using your hands. Do not overmix. Use a disher and portion out meatball mixture into even balls; repeat until all meatball mixture is used. Heat a layer of refined coconut or avocado oil in a large skillet over medium heat. Fry meatballs in batches until browned on all sides and cooked through. Transfer to a plate. Pour out oil if excess remains. Add 2 teaspoons avocado or refined coconut oil to skillet over medium-low heat. Add garlic and, stirring constantly, cook until fragrant, about 30 seconds. Add remaining sauce ingredients and stir to combine well. Bring to a low boil then reduce heat slightly and simmer for about 5-10 minutes or until a bit thickened. Return meatballs to skillet and simmer 3-5 minutes to absorb sauce. Serve over zoodles or alone and top with fresh chopped parsley. I think I messed up on this. The sauce was extremely watery but I didn’t have coconut milk? I’m guessing that really does make this work. Oh yes! The coconut milk makes all the difference! Once again your recipe is a success! So delicious and that sauce is perfect. It actually reminds me of spaghettios from my childhood 😅 I mean that is the best way of course! I made this tonight with a few alterations (added 1/3 of an onion, 1 egg and some almond meal). I also baked instead of frying. My pickiest eater LOVED them!! And my other son was licking his plate!!! SO good! This was amazing. i halved the sauce and served over zoodles. will make again many time. Made this tonight! Admittedly I made several modifications. It’s a worknight and no time for homemade meatballs. I bought pre-made raw GF grassfed beef meatballs and baked at 450 for 20 min. I’m weird about coconut in savory recipes and I tolerate dairy so I subbed 1/4 c heavy cream for the coconut cream. I served it with roasted spaghetti squash. Easy and so delicious. Thanks! Next time I will definitely try your meatball recipe. Maybe I’ll even be daring and try the coconut cream! Does the sauce taste coconutt-y? What size can of crushed tomatoes do you use for this? Two14.5 oz cans or two 28oz cans? Looking forward to trying this! Thank you. Sorry! Two 14.5 ounce cans 🙂 I’ve clarified in the recipe! 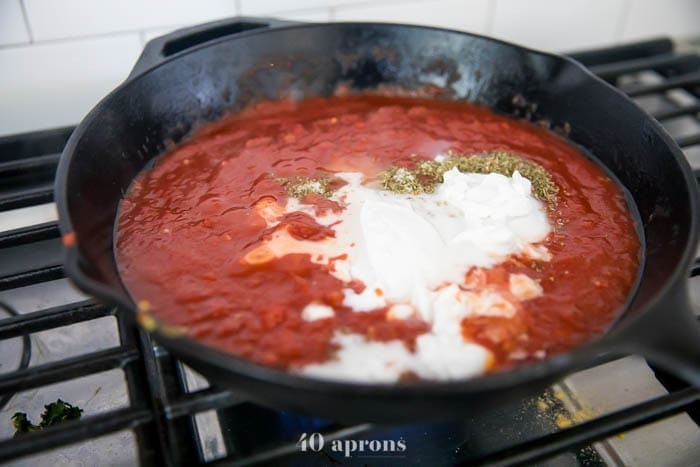 This recipe looks great, but what size cans do I use for the crushed tomatoes? So sorry about that – 14.5 ounce cans! This sounds delicious!! Do you have the macros by any chance? Cheers!